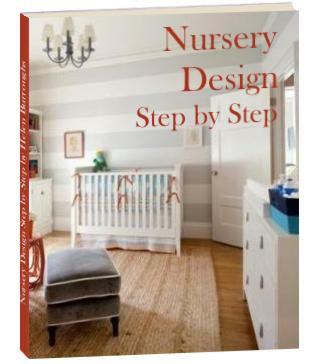 I designed my Serene Blue and Brown Nursery. Around the "spa" blue color. I wanted something that wasn't the traditional "baby blue" color tone. The "spa" blue color is more serene and soothing. The paint color name is Tidal Pool Blue from Behr. I purchased the crib from a second-hand store and painted it silver metallic. All the other furniture was purchased on Craigslist and then spray painted either cream or silver. The over-stuffed chair was also purchased 2nd hand and then professionally cleaned. Where did you purchase the bedding? I love it. 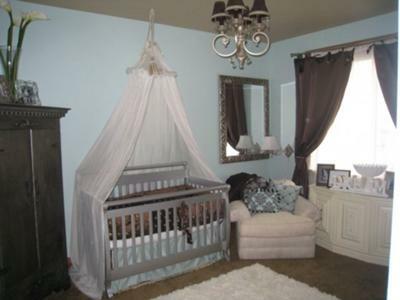 I love the blue color it's so calming - a beautiful nursery - well done! Return to Baby nursery photos contest.